How to Add Your Own Content? In Kontent Machine 2, we introduced the so-called “custom boxes”. That feature allows you insert external content right into the built articles. To access it, you just need to press Add Own Content while working with a campaign. 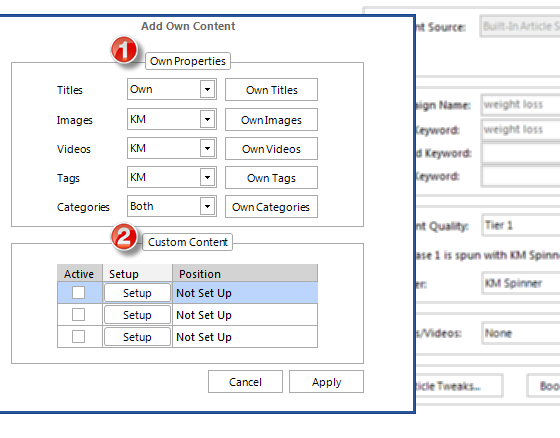 Here you can modify the Titles, Image URLs, Video URLs, Tags and Categories by typing your own, letting Kontent Machine build them or using a combination of both. Here is where you can type or load a text file with content that you want to include in the articles. After clicking on Setup, a new window will open. You have the option to spin your content using one of the included spinners, or you can directly paste it in spintax. Kontent Machine will recognize that. Once you click Save, you will need to click on the checkbox in the Active column in order to activate it. You can do that with up to three snippets of text.